MagicCatJenny: I'm going to be on a cosplay panel! I'm going to be on a cosplay panel! 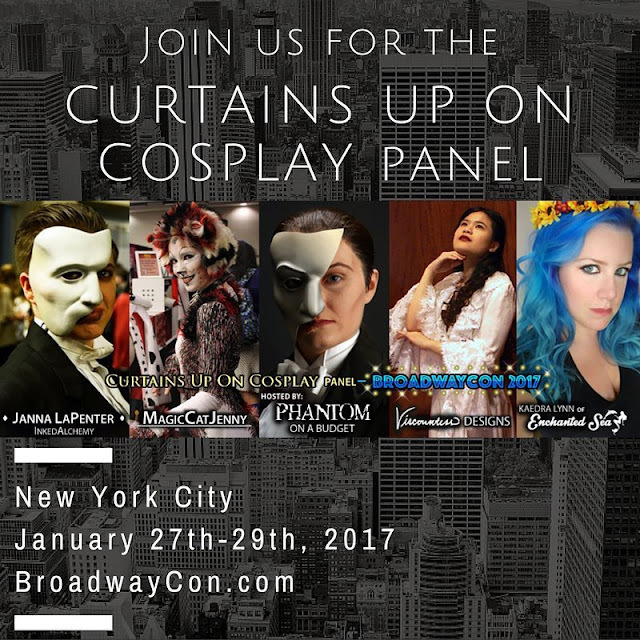 BroadwayCon is coming back and guess who gets to be on a panel about cosplay? Me!! That is, if I can get my costume done in time... With my consulting work, Etsy shop holidays traffic, and traveling to CA for 3 weeks (3!! ), I'm really really running out of time. So far the only information we have on the panel is that it's called 'Curtains Up On Cosplay' and it's moderated by my new friend Lindsey of Phantom on a Budget. The other panelists are Enchanted Sea, Viscountess Designs, and Inked Alchemist. More news will be updated here as it comes! If you're attending the convention, please come to the panel and say hi!